If you hear food vendors at a Sicilian market shouting bastardoni – big bastards – don’t be offended. They’re just hawking their wares, which are autumn prickly pears from cactus plants. The wild and wonderful food markets in Sicily are a blast to shop in and we always look forward to buying a case of bastardoni. These are the fattest, most succulent fruit of the cactus plant, harvested in the fall in eastern Sicily. The smaller variety of prickly pears, sometimes known as agostani for the fact that they ripen in August, are generically known as fichi d’India – Indian figs. They do not come from India nor have any relation to figs, which goes to show you that you can name things any way you want, but what’s important is eating them. 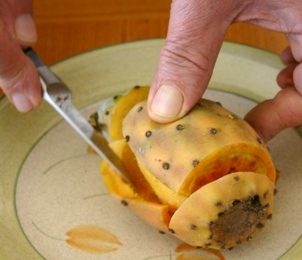 The bastardoni are the most highly prized prickly pears because they are bigger and juicier, and are a result of cutting off the first cactus flowers in late spring, a procedure known as the scozzolatura. This results in a second flowering of the cactus plant. The fruits then ripen in the fall during the rainier season, which produces juicy plump fruits. Cactus plants were often grown as a sort of fence between neighbors in Sicily, and the prickly pear fruits were a handy thirst-quenching treat when working in the fields. According to a Sicilian legend, the practice of the scozzolatura began because of a feud over property lines between neighboring farmers. In a fit of anger, one farmer cut off the flowers of his neighbor’s cactus, in an attempt to destroy his neighbor’s prickly pear crop. 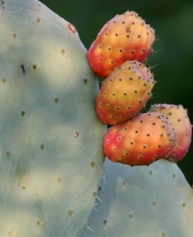 Instead, the cactus bore fruit later in the season, and the prickly pears were much larger and juicier than normal. 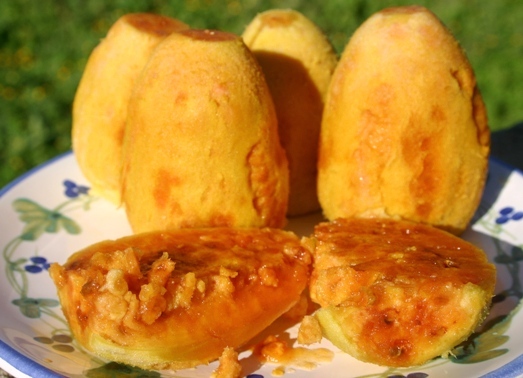 Soon the practice of the scozzolatura became widespread, and this “bastardized” version of prickly pears was born. 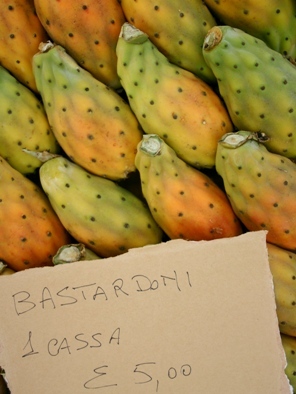 In some areas of eastern Sicily, there are now cactus plantations that are irrigated, which produce the beautiful bastardoni found in Sicilian markets through December. If you want to try eating bastardoni, the first step is to peel it, or better yet, get someone to do the peeling for you. The peel is studded with fine prickly spines that like to imbed themselves in delicate flesh, and can be an uncomfortable nuisance for days. Many Sicilian restaurants serve seasonal fruit including prickly pears, so you can let the waiter peel and you just taste. Cutting back the peel, you’ll be surprised by the color of the prickly pear fruit, which can be deep yellow, pure white, or a stunning crimson. The fruit has a slight floral fragrance reminiscent of citrus, and a very mild flavor, like a pear with an identity crisis. The juicy pulp is punctuated by an enormous number of seeds that Sicilians simply swallow. It is not a fruit to everyone’s taste, but big bastards seldom are. If you are not already aware, rural Superior AZ held their first annual Prickly Pear Festival. The vendors were extraordinarrily pleased (The best venue ever was a common comment. Will no doubt become an annual event. It followed several recent classes. .It was a cohosted event by the Boyce Thompson Arboretum & The Superior AZ Chamber of Comm. Best regards, Tom Madden, Florence, AZ. my grandfather just loves prickly bears. we only had the ones from california. but they were delicious. he was from poleramo. and as a kid they were the treet of the fall harvest. his farm may have grown them. i have some in my yard but they dont grow big… so this year i may try to deflower then.